November 2018 has been a very eventful month for the VGC 2019 Sun Series. The format is almost done and before we head to Moon Series and, with 2 Regional level events and an International Championships, a lot has happened and it's time to look and see what's happened in the format. A lot has happened and as you'll learn, most of the past lessons we're just cemented and locked in, so let's look at what's happened. While Lunala has already seen usage in the 2019 Sun Series with it already gaining over 6300 CP and is currently ranked #14 on VGCStats as of November 26th. Lunala has seen success because at Memphis Regionals, Lunala had 3 appearances, 3 at Portland Regionals, 4 at the Lille Special Event, 4 at Latin American Internationals, and 3 at Roanoke Regionals for a total of 17 appearances in Top Cut so far. The strength of Lunala is in part to its Shadow Shield ability which acts very similar to Multiscale. This means that if Lunala's at full HP, it becomes very difficult to KO outside of super-effective hits. It also gains access to powerful speed control options in both Tailwind and Trick Room to always help out your other Pokémon accomplish their job. With powerful offensive moves in its signature Moongeist Beam and Psyshock to threaten most Pokémon barring Dark-types like Yveltal and Incineroar, although more offensive Choice Specs sets may run coverage options like Moonblast and Focus Blast to help deal with these two. While Yveltal did manage to win the very first Regional in the 2019 Sun Series format, it hasn't done too much since then, and with the rise of Xerneas on the most popular team, Yveltal has taken a back seat in the format as it needs teams with at least 2 answers to threaten Xerneas. With how popular Lunala is as shown above, Yveltal is coming out to answer this makes a lot of sense. At the Lille Special Event, Arthur Blanc-Renaudie finished 6th with Yveltal and paired it with Naganadel and Scolipede. At the Latin American Internationals, Caio Romanini finished 8th with Yveltal and paired it with Ferrothorn and Crobat. At the Roanoke Regionals, Mark Jackson finished 3rd and paired it with Amoonguss and Nihilego while Nicolas Peckman finished 7th pairing Yveltal with Kartana and Adbul Barrie finished 8th pairing Yveltal with Solgaleo. The strength of Yveltal is how if left unchecked, it can tear through many teams once any Xerneas your opponent may have is dealt with. More offensive Yveltal may be seen with items such as the Black Glasses moves such as Knock Off, Sucker Punch, and Foul Play to deal as much damage as possible while bulkier variants may run items such as terrain seeds and even pinch berries and moves such as Tailwind and Snarl to disrupt the opponent while being difficult to KO. Used by Paul Ruiz to finish 4th at the 2019 Latin American Internationals, Moltres was great to give Paul's team a few reasons. Moltres can support its team thanks to Tailwind and with its powerful Fire-type move in Burn Up to threaten opposing Steel-types like Solgaleo, Ferrothorn, and Kartana that can threaten his Xerneas. Paul also had Kyogre on his team which means Moltres can use its 100% accurate Hurricane to threaten prominent Grass-types like Amoonguss and Ludicolo that can give Kyogre some trouble. Used by Mark Jackson to finish 3rd at the 2019 Roanoke Regionals, Nihilego is notable due to how its able to threaten a lot of very popular Pokémon in this format. Its Rock-type move of choice in Power Gem is great to threaten Pokémon like Yveltal, Incineroar, and the occasional Ho-Oh. Sludge Bomb is great to threaten Pokémon like the Tapus, Clefairy, and the most important one in Xerneas. Its final coverage move is Grass Knot which can hit both Groudon and Kyogre which is great as it means Nihilego can almost always be a very annoying Pokémon to deal with for opponents, but its very low physical bulk is a large handicap. Talonflame has been popping up in small showings in the format. It's first big showing was at the 2019 Frankfurt Regionals from Willem Guerts to finish Top 8. The strength of Talonflame is its access to some great support moves such as Will-o-Wisp, Quick Guard, Tailwind, Taunt, and Whirlwind. Its offensive moves in Brave Bird and Flare Blitz can hit a lot of popular Pokémon like Grass and Steel-types that threatened Willem's Groudon and Xerneas. Pokémon like Kartana, Venusaur, and Solgaleo will end up falling to Talonflame which can make it a great supporter. Talonflame's Gale Wings ability is great to give it access to priority Flying-type moves which sadly in Generation 7 was nerfed to only exist when at full HP. Most Talonflame at full HP will try to take advantage of Gale Wings to set-up Tailwind if need be or just go for Brave Bird to KO something or deal some big damage. Salazzle is a very interesting Pokémon. Its signature ability in Corrosion is great to poison any Pokémon while its other ability in Oblivious is great because with the popularity of Taunt users like Tornadus, being able to shrug that off and still use support moves like Encore and can still Protect to help compensate for its frailty. Recently, Kyle Livinghouse used Salazzle to finish 4th at the 2019 Roanoke Regionals. What Salazzle does well its Poison-type STAB in Sludge Bomb can threaten Xerneas while its Fire-type STAB in Flamethrower can threaten Pokémon like Ferrothorn, Solgaleo, and Kartana. Salazzle also has the special note of being the fastest common Fake Out user in VGC. Salazzle's very low bulk means it won't survive very long and take a lot of hits, but it can be a very annoying Pokémon if played properly. Dialga has seen some success late into the Sun series. It's first big success was in the Seniors division at the 2019 Latin American Internationals where Alfredo Chang-Gonzalez used it to win the event and released a pastebin of his team. At the Roanoke Regionals, Westley Long used it to finish 5th while Zach Carlson used it to finish 13th. Something Dialga does well is thanks to its Dragon-type, Dialga can switch into Kyogre's Water-type moves and its Steel-type means it can switch into Xerneas' Fairy-type moves which are the main reason Dialga sees play. Alfredo's Dialga was a Trick Room variant that allowed it to support his slower Kyogre as well as threaten other Kyogre with a 100% accurate Thunder in the Rain. He also had Flash Cannon to deal with Xerneas though if Xerneas successfully uses Geomancy, Flash Cannon's usefulness is severely weakened. The final notable Pokémon in Torracat was used by Melvin Keh to finish Top 8 at the 2019 Latin American Internationals. The pre-evolved form of Incineroar, Torracat also gets access to the same tools such as Intimidate and Fake Out. Unlike Incineroar, Torracat is a pure Fire-type so it isn't weak to popular Fighting-type moves like Toxicroak's Low Kick, Solgaleo's Superpower and Kartana's Sacred Sword which means it can better deal with these 3 Pokémon. Torracat has a higher speed stat at base 90 compared to Incineroar's base 60 speed stat which means it naturally has a faster Fake Out than other common Pokémon like Toxicroak, Hitmontop, Ludicolo, and Incineroar. 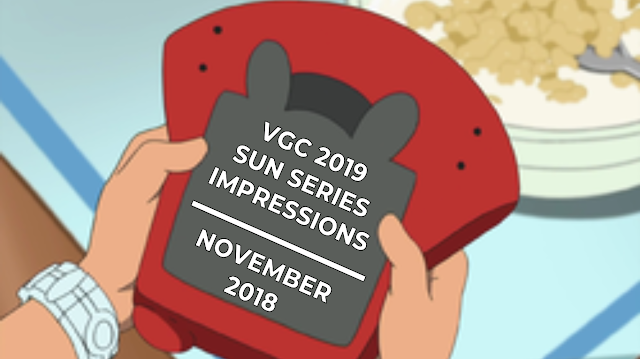 With the VGC 2019 Sun Series only having 1 month left, December will be the last chance for this metagame to really develop. The events to watch out for is Brisbane Regionals on December 1-2, Harrogate Regionals on December 15-16, and Anaheim Regionals which is also on December 15-16. What happens during this month will be very interesting and the big question will any notable restricted Pokémon pop up or will the same strategies prove their dominance.